Here's a sneak peek of the new Sale-a-bration Patterned Occasions stamp set available starting January 22. With the Regal Rose and Chocolate Chip cardstock combination, I was able to stamp one of each stamp for a variety of cards. Here's a sneak peek of one of the new Sale-a-bration stamp sets available starting January 22. In fact, the stamp set, Designer Series Paper and button all come from the new flyer and coordinate so nicely! Please let me know if you haven't received your flyer. 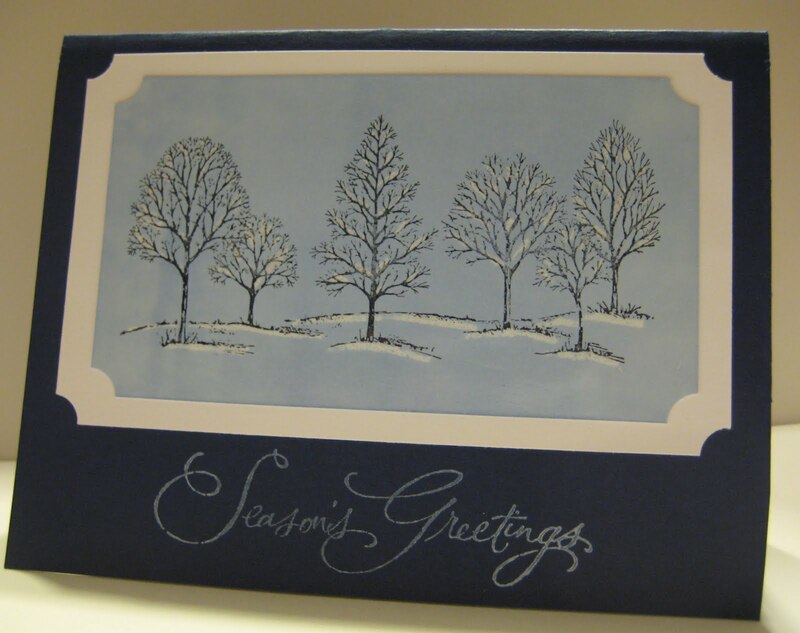 Stampin' Up has added new items to the Clearance Rack. Here's a great chance to spend a little money on yourself this holiday - emphasis on a little - some things are up to 80% off! We had a snow day yesterday and didn't get to have our Christmas party at school. So for my thank you notes for my students, I wanted to make something that wasn't so Christmasy since they won't be getting them until January. I went to my retired Christmas Designer Series Paper to find a pattern I had enough of that would allow for several 3 x 4 pieces of the same thing. I need to make several and want something I can put together pretty quickly. 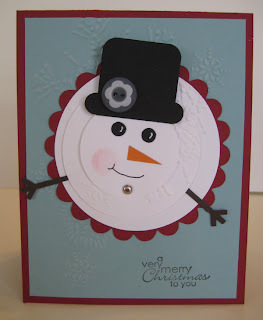 This Real Red and Baja Breeze combination feels wintery and thanks to my Jolly Bingo Bits set, it's a one stamp card and done. We started making Christmas cards at my Christmas in July Stamp-a-Stack, and I was sure to make a set for myself at every Christmas event I did. BUT there is one problem when your stamping friends stamp with you -- they have made all of my cards too! So here's the card they got in the mail. I finally decided to part with this smore snowman card that I made in my pre-blogging days. That's one of the nice things about having a blog - you can keep a virtual copy of all the cards you ever make! Here's another one of my favorite past Christmas cards. Click here if you want more details. While I am busy making my Christmas cards, I thought I would repost one of my favorites from last Christmas. Last night was my one stamp-a-stack a year that we don't actually stamp a stack of card. 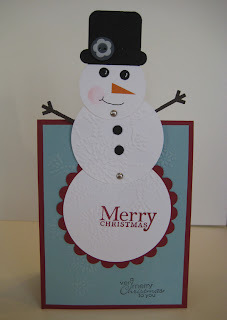 At the December stamp-a-stack, we make Christmas tags. Everyone went home with 30 tags last night! 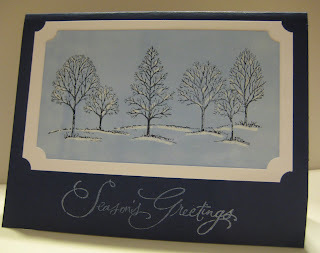 We have made easel cards before in stamp club, but I wanted to do another to use my new framlit. To make this one a little different, we made a "stained glass window". What's really neat about this card is that you can put a battery operated candle behind it for an added glow. 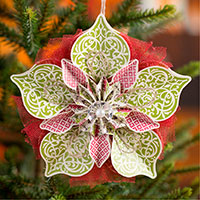 The ornament on the cover of our holiday catalog was such a hit that Stampin' Up! is making it available to you - just in time to deck the halls with terrific trimmings you've made yourself! Order now so you will have plenty of time to make them for Christmas gifting-or for your family tree! Here's a quicker gift card holder if you have a number of them to make. It's a swing card just like the Santa I posted Saturday, but it is horizontal, and has a lot fewer parts. This turned out to be a popular project at stamp club. I first saw the idea of the Santa face made this way on Pinterest. It was made by Diana Ball-Seitz, and she used it as a gift tag. I usually do a gift card holder as one of my Christmas projects, so I made it into a swing card to hold a gift card.